The Sydney Morning Herald reports that the Country Fire Authority in Victoria is blaming Apple's mapping data for errors in its own FireReady bushfire information app. 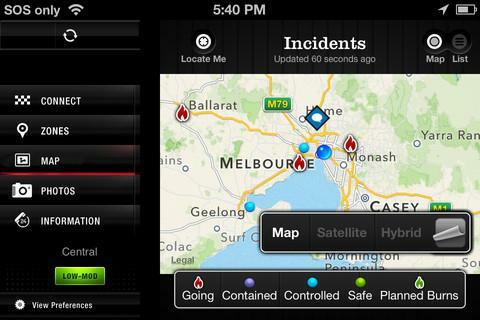 Officials say that they were forced to rely on Apple Maps for FireReady, which is available on the iPhone and the iPad. "Users report that towns are located on their maps at the centre of the district rather than on the actual township itself," said one CFA spokesperson. Another official added that CFA has already received numerous complaints regarding errors in the FireReady app. "This makes it very difficult to quickly determine the location of fires once alarm calls are being received," the spokesman said. "This creates potentially dangerous situations and delays to activate phone trees if required." According to CFA, attempts to contact Apple have been met with suggestions to report inaccuracies through a function provided in the Apple Maps app. CFA has urged people not to rely solely on one source for emergency information and pointed users to its website, which relies on Google Maps. Apple's Maps app has been a sore point for the company since its introduction with the release of iOS 6. Its occasionally incomplete or inaccurate data has led officials in Australia to advise against relying on it in the past. The Cupertino tech giant's troubles in the mapping sector have been cause for light ribbing from Google, which Apple dropped as a mapping solution for Apple Maps.